GS1-128 (UCC/EAN-128), owing to its unique feature for carrying information of encoded data, is widely used in international trade field. Therefore, a mature GS1-128 (UCC/EAN-128) barcode generating SDK will bring great benefits to your business. To help C#.NET developers have a better grasp of how GS1-128 (UCC/EAN-128) barcode is generated on images and documents using C#.NET code, we provide this online tutorial for users. RasterEdge GS1-128 (UCC/EAN-128) barcode creator SDK is a professional third-party barcode generating toolkit for .NET. This C#.NET linear barcode creator SDK combines advanced & high-quality GS1-128 (UCC/EAN-128) barcode generating features with mature document imaging technologies. Thus, using this GS1-128 (UCC/EAN-128) barcode generating component, C#.NET developers can easily generate and insert created linear barcode into target documents and images. As is said above, RasterEdge C#.NET GS1-128 (UCC/EAN-128) barcode generator add-on is a fully-featured .NET solution. And the key features of this barcode creator control are listed below. You can easily generator GS1-128 barcode and save it to image files/object using this C#.NET barcode generator control. The following steps will show how to create a GS1-128 type barcode encoding numeric data text "(01)123456789" into the image object with XImage.Barcode.Creator. Please copy the sample code as follow to generator a GS1-128 barcode. In daily-life applications, you may need to draw or add GS1-128 (UCC/EAN-128) barcode on some image files for certain purpose. Then this C#.NET GS1-128 (UCC/EAN-128) barcode generator add-on will be a great choice. Using the APIs that RasterEdge .NET GS1-128 (UCC/EAN-128) barcode creator add-on offers, C# developers can accurately draw a standard GS1-128 barcode on target image files (supported image formats are JPEG, BMP, GIF and PNG). 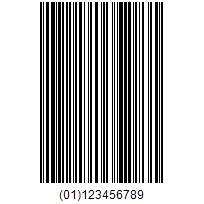 In the following example, we will take GS1-128 barcode generation on a PNG image file as a case to illustrate. Currently, GS1-128 (UCC/EAN-128) barcode generator add-on for .NET, C#.NET has been widely used in document management and file tracking field. Different from other GS1-128 (UCC/EAN-128) barcode creator SDKs on the market, RasterEdge C#.NET barcode creator add-on allows developers to select one page from source document file (supported document files are PDF, Word, TIFF, Excel and PPTX) and insert a GS1-128 (UCC/EAN-128) barcode into selected document page with accurate location. With the following C# programming code, you can easily draw a fully-customized GS1-128 (UCC/EAN-128) barcode on target PNG image file in C#.NET application.